Do you have to spend thousands on a long, very detailed business plan in order to get funding for your business, product or app? A One Page Business Plan shows investors that you are serious about your business and have done your due diligence, but doesn’t take away more time than necessary from your business development process. In this article, we’re going to explore the process of laying out your one-page business plan. This is often called an Executive Summary. This will give you something in hand to show your potential investors. Shark Tank and Dragon’s Den Fans: You will see a very similar pattern in the questions that the investors on these popular TV Shows ask. These are fundamental for Venture Capitalists and investors to know before investing in your business. You have an idea for an invention, product or app. Now it’s time to find out who could, can, and wants to pay for the solution you are providing. You will want to think about the consumer, retail buyer and potential investors. What niche are you trying to connect? You may grow your business to satisfy some niches within the market. You should start by targeting one group with particular needs. Being able to target your age range and how you came up with that will show the investor you are serious about your idea. What do they do? Be specific. What does your audience do for leisure, where do they shop, what magazines do they read, and how do they spend their time? What do they care genuinely about? Look at their passions, desires, likes, and dislikes. There are no shortcuts here. Find out, those details out. This will help you create marketing to reach out to your clients. What are their future goals or aspirations? Different ages equal different life stages. Based on the answers you’ve already provided, what would be the goals or aspirations be to your target audience? It’ll take a bit of thinking and some time to get these answers; you’ll see that this process will help you. Where does your ideal customer hang out? Online? Offline? Only a certain percentage of seniors use the newest technology. The younger generations have grown up with computers and don’t know a life without them. Your target audience may be watching TV or YouTube, or do they may read the traditional newspaper or do they go to Twitter for their news. Does your target market go to the local recreational center or are they a part of social media groups? What social media networks do they use frequently? Do they use Facebook, Twitter, LinkedIn, Pinterest, and Instagram? Each of these platforms has researched the age of the individuals that use their interface. Explore what they are and where your ideal customer is spending their time. What kinds of things do they share on social media most often? Least often? You are looking for purchasing patterns. Ultimately, you’ll be selling your idea to them shortly. How extensive is your current database? The more people you have, the more successful your idea will be. Spending money on this part of the business building process is wise. How often will you communicate with your mailing list? Contact your mailing list every month minimum; every three weeks is ideal. Some companies communicate 3 to 5 times a week using various communication channels. What kind of content will you send to your mailing list subscribers and database? Start planning the content as you are researching. Remember you want to provide value to your target market’s life. Have the message ultimately funnel your solution to the problems you solved. How do you plan on advertising your product? This is where most business owners run into a challenge. Remember the medium isn’t the issue it’s typically the message that you send through those mediums that are. Where do you plan to sell your product? Creating a list of where you want to promote and sell your idea will help give confidence to your future investor. What are the top 1-3 frustrating problems your audience faces every day? Answering these will help you with a future marketing message. If you are having a challenge reach out to your network for feedback. Look at these questions as an opportunity to find out more about your target audience. What problems are they already paying to solve? Your audience is already looking to solve their challenge. These are the ideas that get the most success. What are the top 3 to 5 competing businesses that you can find that serve the same audience? Find someone who is offering a similar product to yours. What do they do well? What do they do badly? You are looking for gaps in the marketplace. This is where your business can perform that gap. What does the perfect solution to your audience’s problem look like? The perfect solution looks like their pain, frustration, problems, and issues are solved. You want to avoid platitudes and meaningless statements that anyone else can say. How will you solve the problem your audience has? Pain often motivates an individual to seek out solutions to the problems they are having. What is your audience feeling and thinking about before they see your answers? What are the benefits your audience will get from your solution? List out the features, advantages, and benefits of the idea you have. Be articulate as possible. Having a unique selling proposition, a differentiation factor will help in the selling proposition for your idea. Put some effort in identifying what makes you different and unique. It doesn’t have to belong. Avoid platitudes (don’t know what platitude means, search Google and avoid using them) and puffery. Research some of the best USP’s. Write a few down then have your partner, family, and friends give you feedback. Some marketing pros can help you with it too. What will you sell to your audience that solves their problems? Pain has always outsold pleasure. Think about going on a trip to Europe and then the night before leaving you to get a toothache…You’d most likely think how happy you are you got the extra insurance to rebook your flight and make an emergency trip to the dentist! The dentist has an emergency rate to ease that pain. When it comes to your product, what pain does it solve? What problems have you identified with your idea, product, app, or invention solves? What would prompt 100 million people to purchase your solution? Answering these questions will help you in developing your investor’s presentation. Are these costs monthly? Yearly? It’s vitally important that you know your numbers. Investors like to fund tested ideas with sales already happening. Companies like IdeaPros will partner with you at any stage, it doesn’t matter where you are at in the process. How will you determine your product cost? What are your costs for customer acquisition? How will you calculate your future lifetime customer? What are your landed costs? Just consider all the numbers and remember to watch Shark Tank or Dragon’s Den to get the idea of what numbers you are going to need. Consider your monthly and yearly costs. Ultimately an investor wants to know you’ll make enough to pay them back. If you are in the early stages, but have identified a real opportunity to solve a problem, you should seek out an investment, even with no sales. Just keep in mind you may need to share more of your business depending on your stage of sales. Investors like to see healthy margins. They also like mass affordability and scalability. Initial consumer surveys will show the tolerance level to price and will offer you insight to the most appealing price. Your ideal investment partner will help you at any stage you are at if they like your business idea. On Shark Tank and Dragon’s Den, the investors always question valuations. They want to know your sales “Show me the money” is what they say. You’ll need to have your numbers written down. Most of all you’ll want to show your sales projections. Only a small % of business seeking investment get their partner without sales. If you find a Super Venture Partner who will partner at any stage, even without sales, definitely submit an application to get their advice. Sales, sales, sales! Go and make sales, get more sales, get deposits, make those sales. Get sales training, get marketing training, knock on doors, pick up the phone and close those sales. Investors want to bet on the people who work and will return the investment. What will it cost to build and sell your solution? What are your production costs? How much will your manufacturing costs be? What are your landed costs if you manufacture in another county? It’s always a good idea to interview people who have already done what you are wanting to do, get their insights, their advice and wisdom. Investors want to ensure you know this. Good partners help you turn decades into days with sound advice. Are you prepared to have these questions asked to you? Write down your answers to the following questions, it will ensure you have thought about it and are prepared. When preparedness and opportunity meet then the real opportunity exists. Are these costs monthly? Yearly? One-Time? Do you need additional contractors or employees to build the solution? Do you need to pay yourself for household expenses, rent, etc.? Is the cost of running the business more than the revenue? When will you be profitable? The following questions will help show investors you are prepared to be a partner. What unfair advantages do you have over the competition? Do you have a patent or a provisional patent? What’s special about your business, above you would have looked up the meaning or trite and what a platitude means. Think truly unique and research what unfair advantage you have. Is it the price? Are you able to take market share? What helps people pick you when it comes to their buying decision? Your marketing? Your message? Do you have existing relationships that you can leverage? A database of over 5,000 is very important. Do you have relationships with market leaders who have databases of their own? How much goodwill and favors do you have owed to you? The six degrees of separation exist here. Write down everyone you know and who they know too. Leverage social media and remember sales, sales, sales. How is your solution not easily copied? Most likely you’ve already answered this, scroll back and paste your answer here. Many of the other answers and reminders in this article have outlined what answer you can put here. Investors like investments that are difficult to copy. Try your hand at creating your elevator pitch to get attention. Here’s a simple formula to get you started. Most families struggle to do much as a family unit? When they finally do something it either costs an arm and a leg or half the family sits around bored and complaining. What we do is provide fun for the entire family via an 18-hole mini golf course with professional instruction water-park, games room, miniature golf, go-karts and batting cages al at a reasonable flat fee for the entire family. In one powerful sentence combine your audience, problem, solution, and differentiator. Do you know how – List 2 to 3 negative emotions – frustrated, furious, overwhelmed, clueless, demanding, frightened, desperate, struggling, angry, concerned, or worried. Ideal customer description – Use two to three descriptive words to describe your ideal customer – dog lovers, young adults, chronic pain sufferers, overweight men, homeowners, business owners, brides-to-be, new mothers, etc. What is their hot button? List what your ideal customer is needing. What are 2-3 of their major frustrations? A solution to hot-button will immediately attract more clients, instantly relieves their pain, and puts them in touch with the help they need. Cut and paste some of the ideas from your answers above. Repetition is the mother of all skill. What’s different or unique about your solution? Here are a few examples to help you come up with how unique you are. Performance Gap (problem) = Auto repair establishments have a reputation of being dishonest. Performance Gap (problem) = Going to the dentist can be a painful experience sometimes. How will you stand out from your competitors? Your USP will help you stand out, pick out some of the key differentiators you’ve come up with from the previous answers. What puts you ahead of the pack? People who invest in an entrepreneurial invention, product, or app want to see what you’ve invested. What tools and resources are you bringing to the table and do you have skin in the game? Does this business feel like you? Does the business feel like you? Have you asked other entrepreneurial inventors if getting an investment changed their business outlook? Ensure you are prepared for the responsibilities involved with success. Is it the kind of lifestyle and responsibility you want? Investors are not likely to invest in people who want a lifestyle business. Answer this question honestly and wisely. Investors want to put their money on the winning team and your answers up to them will show where you are at in the success process. Will you get tired of it or do you get energized thinking about it? Answering these questions will definitely prepare you for the test of raising money and propelling your entrepreneurial goals. Good luck at building your dream and having your idea, invention, product, or app succeed. 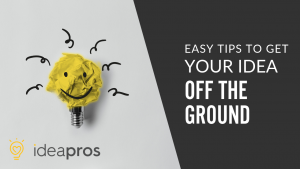 IdeaPros has the resources, manufacturers, and tools to help you succeed at this step or at any step you are on in this entrepreneurial journey. We partner with entrepreneurs at any stage and who are ready to invest in the success of their idea Apply for an interview and let’s explore partnering together.